When you think of a Tyrannosaurus Rex you probably picture a massive scary beast towering over everything in its path. 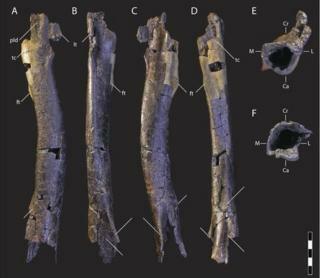 But this newly discovered relative of the T-Rex - a new species called Moros intrepidus - was much much much smaller. A new fossil found by scientists reveals that it was just over a metre tall at the hip, about the size of a modern mule deer, and weighed about 78kg. It was discovered in Emery County, Utah, in the United States, where the animal lived about 96 million years ago, during the later part of the Cretaceous Period. Studies have shown that this particular dinosaur was seven years old when it died and was almost fully grown. The tyrannosaur fossil helps fill a 70-million-year gap in the fossil record. Until now understanding how the giant tyrannosaurs came about has been limited by the lack of complete fossils in North America. 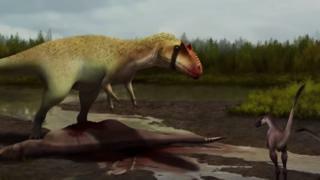 But this discovery is providing important new information about how T-Rex became the main carnivore in North America. Tyrannosaurs, or "tyrant lizards" - the group which this mini-tyrannosaur and T-Rex belong to - were the top land predators during the last 15 million years before the Chicxulub asteroid slammed into the Yucatan Peninsula 66 million years ago. What was the Moros intrepidus like? It may have migrated to North America from Asia. Although it was comparatively lightweight, it was probably very fast on its feet. It could easily have run down prey, while avoiding confrontation with the top predators of the day. What do the fossils tell us? Early in their evolution tyrannosaurs were small and weren't the top predators. 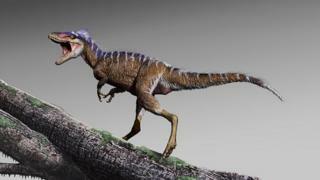 Small-ish tyrannosaurs have been found in North America dating from the Jurassic Period. 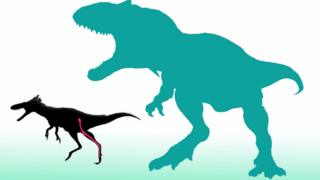 Dr Lindsay Zanno, from North Carolina State University who co-wrote the study said: "Early in their evolution, tyrannosaurs hunted in the shadows of archaic lineages such as allosaurs that were already established at the top of the food chain." At this stage allosaurs were the top predators, but a study published in the journal Communications Biology, argues that environmental changes may have led to their decline and the rise of tyrannosaurs. 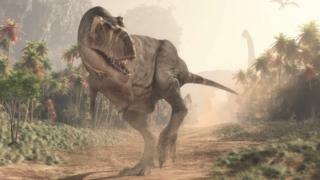 Dr Zanno said: "Although the earliest Cretaceous tyrannosaurs were small, their predatory specialisations meant that they were primed to take advantage of new opportunities when warming temperatures, rising sea-level and shrinking ranges restructured ecosystems at the beginning of the Late Cretaceous." But how would an allosaur cope against a T-Rex of this size? North American tyrannosaurs had become enormous beasts, and at some stage the hulking T-Rex became the top predator. T-Rex could reach more than 3.5m tall as measured at the hip, which along with their sensory capabilities, made them a powerful predator. Dr Zanno says: "We now know it took them less than 15 million years to rise to power."